6x12 Wicker Oil Rubbed Bronze Floor Register Discounts Apply ! 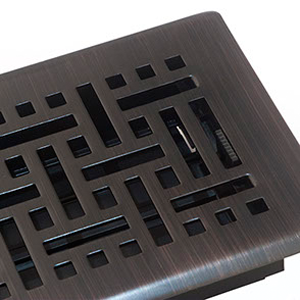 Update old decorative heat registers now with these oil rubbed bronze wicker vents. These floor diffusers have a straightforward installation because you just drop them into the floor opening. These decorative heat registers open and close with an adjustable damper, letting you control the airflow. The floor diffusers damper will not rust because it is made out of a high temperature ABS resin plastic. These decorative heat registers are also protected with a distinctive lacquer coating which prevents corroding and tarnishing. These floor diffusers are made with a durable steel construction meant to support up to 200 pounds. ***Hint: When measuring for decorative heat registers, industry standards require you to measure your floor hole opening. Do not measuring your existing floor diffusers outside dimensions when trying to find the appropriate size. 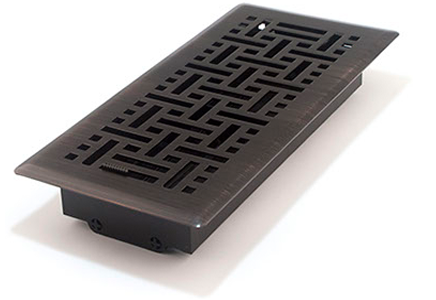 Our floor diffusers come in several sizes and also other finishes. Restyle your space with decorative heat registers to get the look you have always wanted!